Most Early Medieval architecture is a mystery. Almost all of it was destroyed to make place for later structures. A few churches survive, and we have seen Santa Prassede and Santa Cecilia. They survived either because they were out of the way (Prassede) or in much modified form, especially the exteriors (Cecilia). For the later Medieval, we have remains of several different kinds of structures: towers both as fortresses and bell towers; monasteries (the biggest and best are not in Rome); and housing, although the houses that remain in Rome are invariably of the upper classes. We also have late Medieval structures preserved in works of art and in tourist maps and brochures. Many of the tourist items were produced just at the end of the Medieval or at the beginning of the Renaissance and were usually designed to guide Jubilee pilgrims. Renaissance artists were fascinated by ancient Rome's ruins, often fancifully reconstructed and filled with biblical rather than Roman scenes -- they were not much interested in painting the remains of "lesser", i.e., Medieval, structures. Some pre-Raphaelite painters, in reaction to the Mannerists (who painted "in the manner of" Raphael), painted simpler scenes using Medieval looking backgrounds. "Modern" Roman artists -- in Roman parlance, that's anything after about 1750 -- when they were still doing representational and impressionistic art made images of Rome's Medieval past. History always intervenes, and a watershed date for Roman architectural history was September 20, 1870, when Rome as the last vestige of the Papal States fell to the Bersaglieri forces of the Risorgimento. From the beginning, there was never any doubt that Rome would be the capital of re-unified Italy. That meant massive redevelopment in the 1870s and '80s. The empty spaces of the disabitato were rapidly filled. A huge flood control project drastically altered the Tiber shoreline, and many medieval structures were replaced or buried behind modern facades. Of course there had already been several waves of urban renewal in the Renaissance and Baroque periods, the most drastic of which was the imposition of wide straight avenues connecting the Pilgrimage Churches by Pope Sixtus V (Felice Peretti -- pope from 1585 - 1590). Much of Medieval Rome disappeared then and during the construction of the great Palazzos from the Renaissance until the 1880s. A lot of what was left disappeared in the post-Risorgimento building boom, but luckily, artist Ettore Roesler Franz decided to document what was being replaced in a series of watercolors called Roma Sparita -- Disappearing Rome. The paintings are now preserved in the Rome City Museum in Trastevere (one of the Museum's several venues), and there are several "art books" available that show them very well. 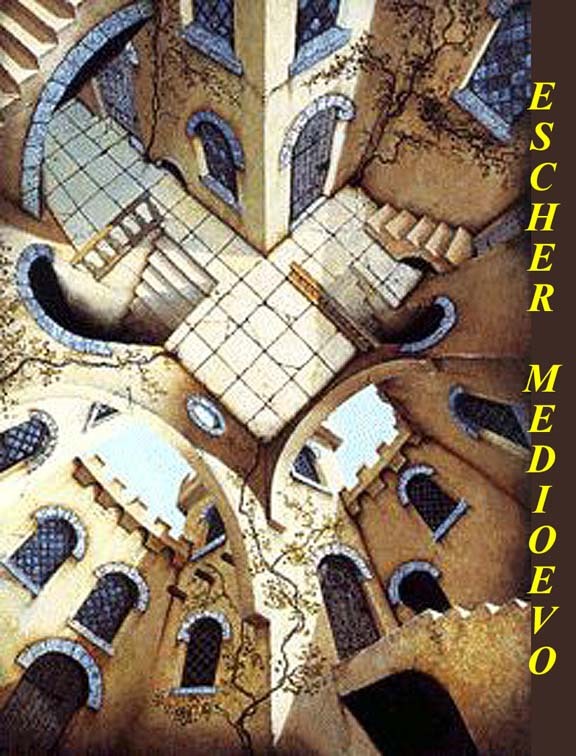 Some of his works are on the Internet and you can see them by linking through http://images.google.com/images?hl=en&lr=&ie=ISO-8859-1&newwindow=1&q=roesler+franz Ettore Roesler Franz has always been though of as a workmanlike journeyman -- never a "Master" -- and someone whose works would be studied by a "Rome Historian" rather than by an "Art Historian". What's left in Rome (and elsewhere, as analogs)? Churches as mentioned above, for example: S. Cecilia: Looks almost like an ancient Roman temple at the back of a portico -- except, of course, that the courtyard has no side porticos. The roof has acrotiria in the same positions as those of ancient temples and the central roof fixture, a crucifix, is in the position usually saved for Apollo or the dedicatory god/goddess. The fabric of the church and its entrance narthex is 9th century and it's built over the ruins of an earlier church and of even earlier ancient Roman residences. The urns on the rail above the narthex are probably Renaissance. The campanile, bell tower, is 12th century -- you can this tell by the triple windows. Later campanili typically had double windows and sometimes pairs of double windows. Abbeys There had been a flurry of church aggrandizement during Rome's brief "Carolingian Renaissance", but the real building boom, when many churches were rebuilt or enlarged, coincided with the period of Roman prosperity in the 12th and 13th centuries (i.e. almost at the end of the Medieval period and of the Medieval Warm Period) . Many of Rome's churches were turned over to the Benedictines and to Benedictine offshoots in the early monastic phase, and more were given to the mendicant orders (Franciscans, Dominicans and offshoots) in the late Medieval period. Two of Italy's most famous abbeys -- outside of Rome and looking much as they did during late medieval times -- can give us a better idea of "Roman abbey architecture." Both of our examples, the Franciscan abbey in Assisi and the Benedictine Monte Cassino Abbey, have had major recent reconstructions, but both were rebuilt to the "original" plans, i.e., to the way they supposedly were in the Late Medieval. The September 26, 1997, earthquake heavily damaged the Church and complex in Assisi. Reconstruction money flowed in rapidly -- $50 million from the Government of Italy and another $50 million from the Vatican. Collections worldwide more than equaled the Government and Vatican donations. Initially towns around Assisi complained that all the money was going into the pilgrimage/tourist town, but Franciscan administrators of the funds found ways to spread the excess funds around, and just about everything in all the towns has been rebuilt in the last five years. During WWII, German forces put artillery and observation posts within the Abbey as allied troops moved north toward Rome. A long battle for the plateau on which the abbey stood ensued. There were heavy artillery barrages and bombing attacks on the monastery by the US and allied forces. Eventually, on May 18. 1944, after five months of fighting, the position was taken by American and allied forces (mostly Poles), but by that time there was nothing left but rubble. The artistic loss was great -- Italy's best medieval and Renaissance artists had decorated the place -- but, contrary to what has sometimes been reported, much of the library was saved. Some Medieval and Renaissance books had been stashed in caves in the mountain and others had been evacuated. It is also worth noting that both the Vatican and the Benedictine Order agreed to the allied bombing and artillery attacks in advance. The Monastery was completely rebuilt using detailed architectural drawings and photographs taken before the destruction. See https://en.wikipedia.org/wiki/Monte_Cassino. Houses from the earlier periods simply weren't as substantial as those built later, and the vast majority of them were replaced during the boom years of the late 12th, the 13th, and the early 14th centuries. Any houses that remained after that were the most likely to be removed in later centuries. At any rate, there is not even much evidence that new permanent housing was built in Rome during the long population decline from the time that Constantine decamped first to Milan and then to his new capital, Nova Roma, later Constantinople, until the short-lived population rise that started in the 12th century boom. While the population was shrinking, most folks apparently just moved into increasingly ruinous ancient Roman structures, keeping them in the best repair that the long depression economy could provide. There were exceptions, of course, particularly in the growth of the two Roman "borghi" -- like fortified villages -- one around St. Peters on the Vatican hill and the other south of the city on the Tiber River near the church and monastery of St. Paul's Outside the Walls. Both of these "borghi" were built as defenses against ship-born barbarian raids up the Tiber River in earlier Medieval periods. But these places were popular in later times and so they were also ripe for later redevelopment. Examples of late Medieval housing still exists in fairly large numbers in Rome, but we'll start with what isn't there and why. Housing for the lower orders didn't survive. It was still, essentially, "in the ruins" and remnants of their habitation there were later removed . Any new lower-class housing that was built in the Late Medieval would probably be built for them by patrons, employers, or landlords, who would have no interest in maintaining such structures beyond their useful lifetime. After that they would be demolished and replaced again as needed. There are numerous upper-class remains. A lot of what's visible are towers (torri), some of which still jut up dramatically in the Roman skyline. These were the fortress homes of Rome's noble families and their retainers. Generally speaking, the bigger ones are later than the smaller ones. The towers were offensive as well as defensive. Families tried to overtop nearby towers. The object would be to have a high enough tower that you could shoot or catapult downward at your neighbors. In Rome today, it's hard to see how this "one-upmanship" worked, because there are so many later tall buildings blocking our views of the towers. But we can easily see what was "up" by looking at other towns, where later development did not cut off our lines of sight. There's a great picture of the still-standing "overtopping" family-fortress towers in San Gimignano on the Internet at http://www.sangimignano.com/en/. Rome's huge Torre dei Milizie, which, although now truncated, still dominates central Rome, is now a museum attached to the site of the Trajan's Market Museum just to the northwest of the Imperial Forums. If it looks a little tilted when you see it, it's not your imagination. It's not like the more famous leaning towers in Pisa and in Venice, but it has a bit of a tilt. It was once one of two huge towers that belonged to the Conti family. Its size was determined by the size of the Colonna Tower built about two hundred meters away on slightly lower ground on the slope of the Quirinale Hill. The Conti eventually reduced the Colonna tower to rubble, but their victory was short lived. The Colonna brought in clients from their rural holdings and eventually killed off the Conti -- the Conti family disappeared and their tower passed into other hands. [The main reception hall of the Palazzo Colonna, the largest ever built in Rome after ancient times, is now a private art gallery -- actually open to the public for three hours most Saturday mornings -- and the room and kitchens can be booked for very large receptions. Nobody is quite sure of what to make of the Conti tower's current "Milizie" name -- the most common conjecture is that it may have been held for a while by somebody's militia, perhaps the Colonna militia after it defeated the Conti. The other Conti tower -- still called Torre dei Conti is fifty meters north of Via dei Fori Imperiali where it intersects with Via Cavour. It's also an impressive structure, it's "footprint" and foundation is the pavilion that stood on the Northwest corner of the Forum Pacis built by Augustus. It now houses an office of the Antiquities Ministry and some Rome city government offices. The Frangipane family occupied the Colosseum for a while and had a small tower at one end of the Circus Maximus -- now called Torre dei Frangipane. It's unlikely, however that this was the Torre dei Frangipane where Francis of Assisi lived during his last visit to Rome in 1223. More likely he stayed at the Frangipane fortress, the ruins of which are on the edge of the Palatine near the other end of the Circus Max. Some upper-class Medieval tower housing remnants are now "invisible", having been incorporated and sometimes redecorated into later Palazzos and housing blocks. In many cases, the "belvedere" (= good viewing) at the corner or core of Roman Renaissance palazzos are towers that the same or predecessor families inhabited. The incorporations were in some cases documented at the time when they occurred, but in other cases they are discovered when modern preservation of improvements are attempted. Depending on the personality and wealth of the current owners this can be a good or a bad thing. It's much more difficult and expensive to preserve or upgrade a Medieval core structure than to work on later, i.e., Renaissance or later, fabric. Much of the remaining late Medieval housing in Rome was for what we would call the upper-middle class. A lot of that started as just plain middle-class, but it was upgraded and greatly modified in several waves of consolidation and "gentrification". The first such wave occurred during the late Medieval not long after many of the structures were built. The prosperous period we're talking about lasted almost 200 years, and as folks got richer they wanted to spread out. Many Late Medieval middle class houses in Rome's Trastevere and Campo Marzio neighborhoods were originally built with kitchen garden plots behind them. But buildings first grew into and over those plots and then into each other. A householder might buy out his or her neighbor and connect adjacent houses into one bigger house. It was an old Roman tradition, after all -- it was how Augustus put together his palace on the Palatine. There are numerous examples in Rome of this early aggrandizement. You can see where building were melded together -- uneven doorways, a few steps between unmatched floor levels, an occasional stairway to nowhere. This process continued through the centuries and many Medieval houses weren't very Medieval in the end. In recent times there have been some efforts at "restoration" but it's mostly "Disneyfication" -- a Medieval "look", but with central heat, air conditioning, modern plumbing, full electric kitchens, elevators, big screen TV. Some of Rome's highest priced condos are advertised as "Medieval". 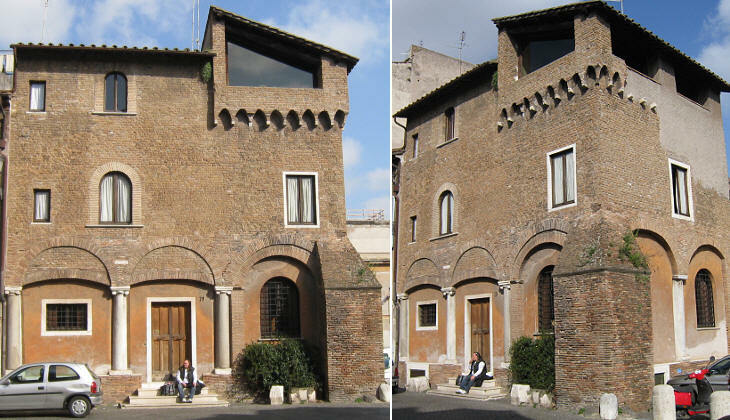 Examples are the often photographed "Medieval casa" across the street from Santa Cecilia church in Trastevere -- on the Internet at http://members.tripod.com/romeartlover/Vasi145l.jpg -- and the mega-buck condos in the Teatro Marcello below the Capitoline Hill -- on the Internet at http://www.vroma.org/images/raia_images/marcellustheater.jpg.